I have been enjoying the Nasturtium Spitfire from Renees Garden Seed ! It has been a great addition to my garden this season. I have enjoyed the blooms and eating them. Never have I eaten a flower until I grew these. They even tasted good! 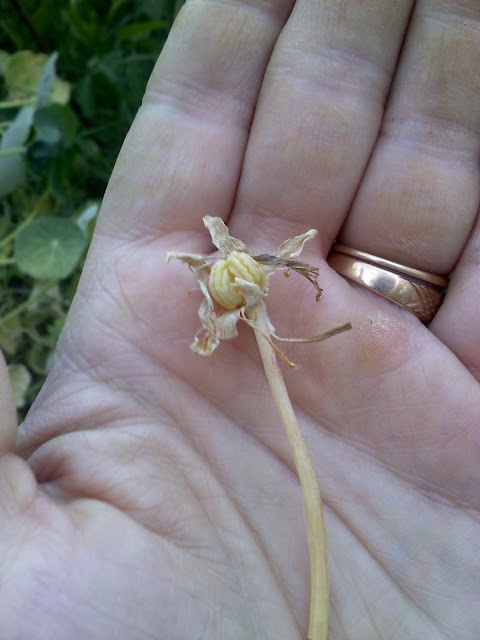 Some of my Nasturtiums that were in full sun have withered away. The ones throughtout my summer garden are still producing and doing well. Most are shaded by Tomato plant and Pepper plants. 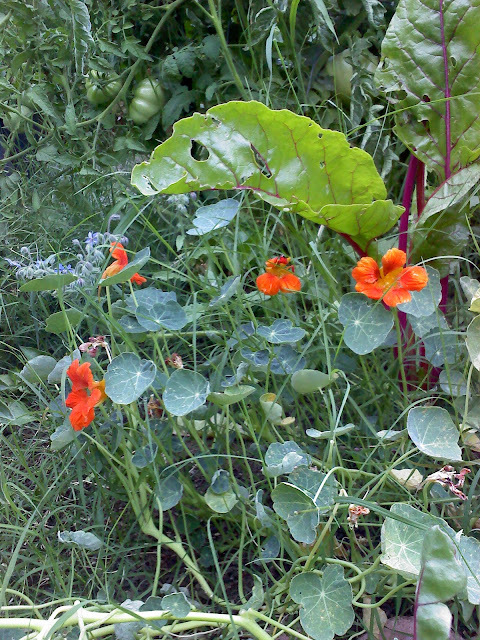 The Nasturtiums in this garden bed are surrounded by Swiss Chard, Peppers and some Borage. Just ignore the grass and weeds! The grass and weeds grow so fast I can barely keep up. Nasturtiums happily live anywhere you plant them. I have noticed they are not very picky! Which is nice, im sure we all have enough high maintenced plants and veggies in our gardens. 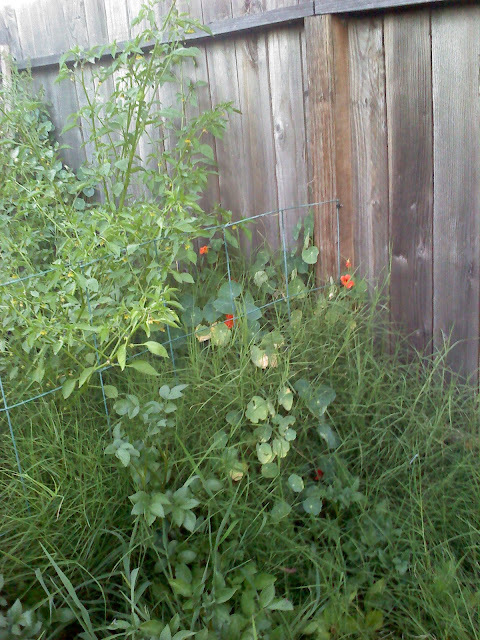 My Nasturtiums have even started jumping the garden fence. I had this bunch planted by my Tomitillos. As you can see they are on a journey to visit my Potato patch. Recently I had to remove some of the not so nice looking Nasturtiums that the sun beat up. I discovered some pretty great things! Can you guess? Seeds! I found alot of these little pods where the flowers used to grow. I spent the rest of the afternoon in search of seeds. Some, I left in the dirt in hopes of them making a comeback next spring. 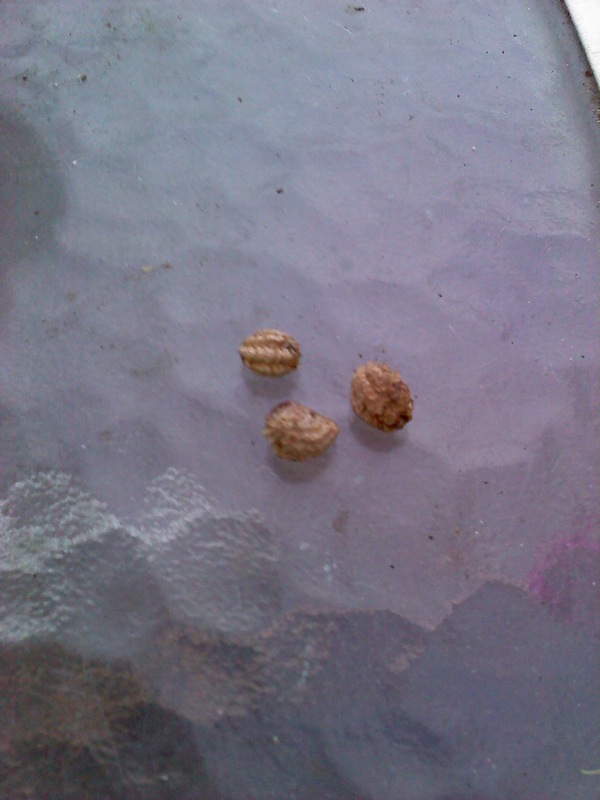 There was also alot of seeds looking like this laying under the plants. Its the easiest seed saving I have ever done. It was effortless! I even got my lil one involved in searching for these little guys that look like brains! Everytime she would find one, she would yell in excietment "saying look mommy I found another brain". I will be sad to see Nasturtiums go once winter hits. Although I am excitied that I will be growing Nasturtiums every year in my backyard garden. How are your Nasturtiums growing? I'm growing Nasturtium "Spitfire" for the GROW project, thanks to ReneesGarden.com for the seeds. It's fun to hear your story, growing Nasturtiums for the first time. I've grown them for a number of years, and each time it's a different adventure. Nice to see yours blooming! Mine look healthy enough, but haven't bloomed since June. I blame the heat, and hope they will bloom later in the season when the weather is cooler. Sorry if this is a double comment but I had to stop and tweet after your pics reminded me of something. Anyway, I just wanted to say that I'm thrilled you're having an awesome experience with them and that they are blooming so much for you. I have fallin in love with Nasturtiums! I am hoping mine will caome back a bit too when its cooler. Thanks so much for letting me be a part of the project. 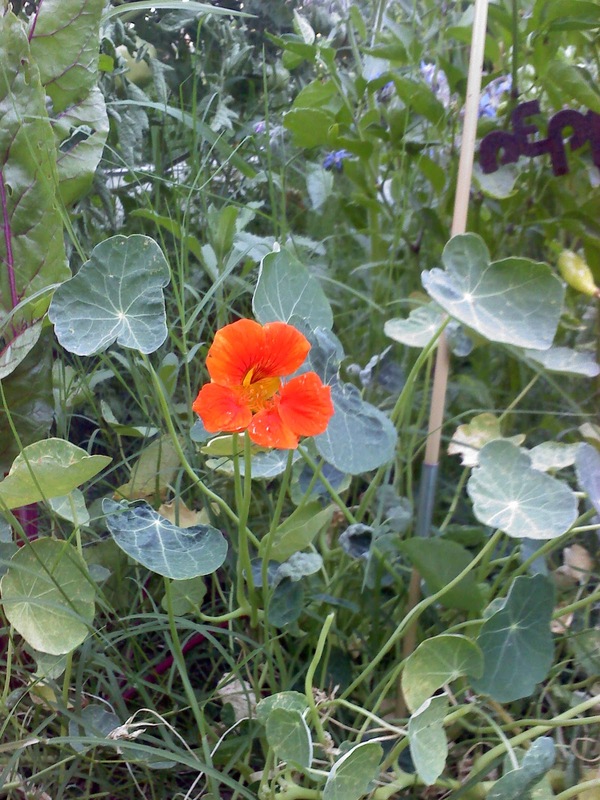 I have learned so much about Nasturtiums and met alot of great ppl by blogging. I look forward to next year! This is really interesting! I've only drunk flower tea before. Never ate a flower.